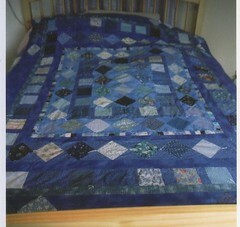 I have been quilting since I was 17. My grandma taught me to make my first quilt (pictured to left). I am not the A-typical quilter, because most of the time my corners don't match up BUT it is VERY theraputic for me! 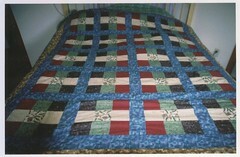 Here is a great article about the Hobby of Quilting along with some pictures of my quilts! to worry about choosing a quilt with fabrics, patterns, or even a price that you hate. Putting together your own gives you so many options. Keep in mind however, if you want to save money, it probably won’t be cheaper especially when you consider the time you will spend on it. Sewing and quilting is an expensive pastime. You need to have both a sewing machine and quilting machine unless you are going to hand quilt. 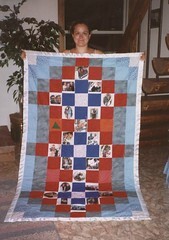 If you hand quilt it, you will need to have or borrow a frame. But you also have to buy the material and other supplies in order to make both your quilt top and the backing. Quilting is a hobby that lets you get away from the world and release your creativity. For many people, it is what they do to relieve stress and find their own peace for a time. 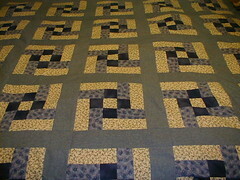 Some find the challenge of quilting a specific pattern to be invigorating, others feel it is enervating and frustrating. The extended procedure of making a quilt begins with selecting the design. This will determine the amount of time it will take you to craft. Pick out a design that matches, or moderately boosts your quilting proficiency. All your hard work and the time you put into it will be obvious in the finished product. Always keep your quilting skills in mind when deciding on a pattern. You might prefer the appearance of an intricate quilt, but have you mastered the art of quilt assembly enough to choose such a complex pattern? Those tiny pieces will allow you to form a delicate design, but they are more time consuming to create. The next thing that you do is pick out your colors. Sound easy? It is not as simple as a novice may think. Most people when making a quilt go to a number of different stores to learn what lines of fabric, patterns and colors various shops offer. Don’t settle with the cloth you locate at the first store. Don't be satisfied until you locate the best selection to fit your needs. Next, if you’ve selected any dark hues such as black, red or blue it is best to prewash and dry them. This is a preventative measure because it will help stop any dark colors from running onto any lighter colors in the future. Drying your fabric before use prevents shrinkage. After this is the cutting which can be quite laborious or restorative, depending on how you look at the task. Make sure the pieces are formed exactly as instructed or else it will mess up the overall effect. Some people think the sewing is the most enjoyable stage. The pieces start to come together and you can see how your choices work in tandem with the entire project and how the pattern is shaping up. Be sure you are sewing it really well because you don’t want the corners to come undone or have points that don’t match up. Don't forget that if you are frustrated walk away from it for awhile. You don’t want to be frustrated when sewing for pleasure. Once you have stitched the blocks together it’s time to affix the sashing and borders. This is the most rewarding experience because all your efforts have made such a lovely object. Whether you quilt it by hand on a quilting frame or even find a machine quilter to do it for you is your decision. No matter what method you choose, you are likely to love the end result particularly after the labor and time you have invested in this functional piece of art and comfort.